It’s warming up outside (120 a couple weeks ago in Phoenix) so what better time to stay cool and tackle some home projects indoors. This week the master bedroom closet received a complete overhaul in our new home. We ditched the heavy boxes and opted for clear space saving storage with Ziploc® Space Bags®. I love that I can see everything and know exactly where it’s at! Our closet barely had any room to move at the beginning of the day, but by the time we added a few new shelves and reimagined some storage cubes, we had an organized and functional closet. 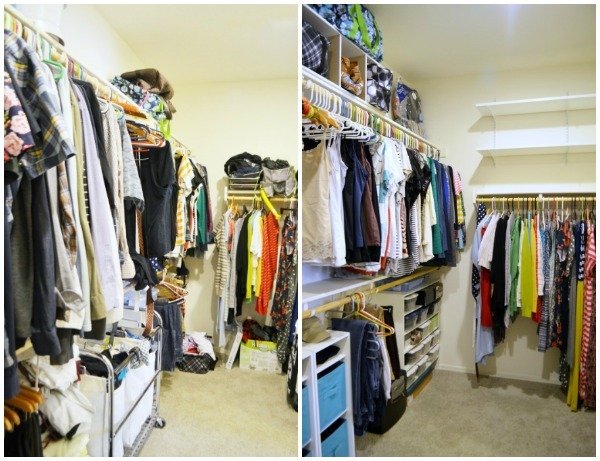 Check out my simple tips for organizing your closet below. We picked up everything we needed at Lowe’s. 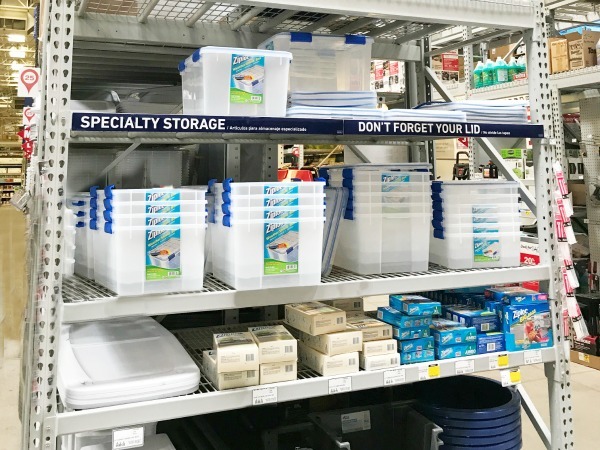 While we were out shopping for closet shelves and brackets, we popped over to the next aisle to check out the bins and storage solutions. 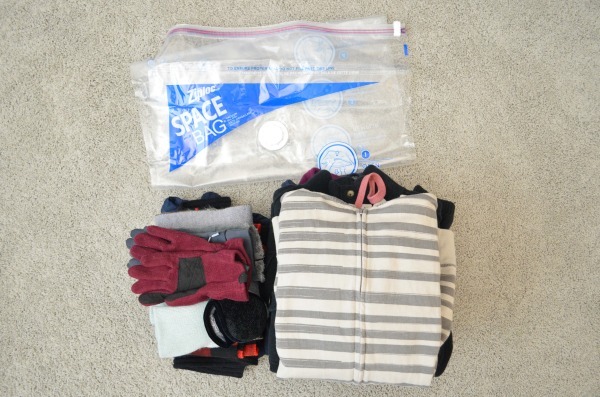 We’ve always been a fan of Ziploc® Space Bags® for travel and storing seasonal items. They provide 3x the storage when compared to uncompressed storage volume. The bags feature the Ziploc® Double Zipper and an easy to seal slider. 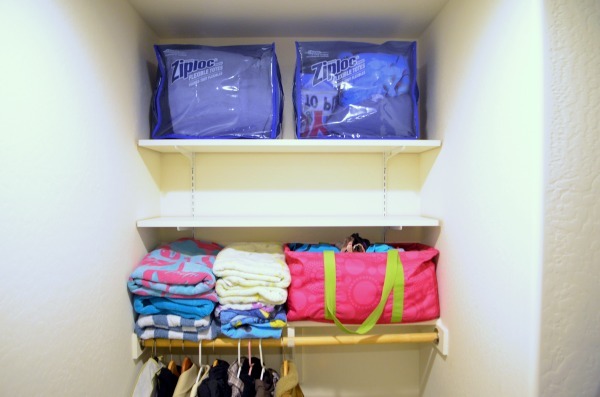 Ziploc® Space Bags® protect against common storage area problems, like dirt, mildew, bugs, and odor. 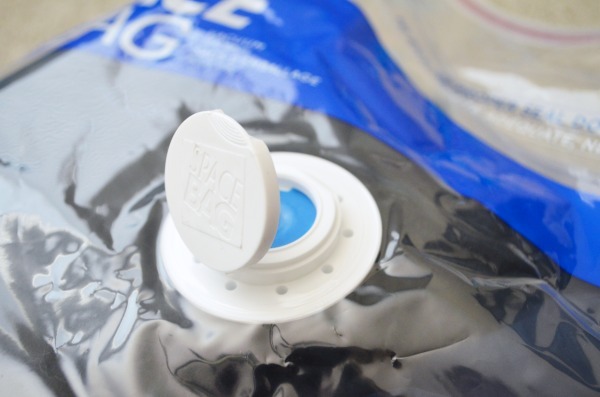 Simply attach your vacuum’s hose to the vacuum seal until the air is removed, seal, and store. For items you want to store dust free, but have easy access to frequently, try Ziploc® Flexible Totes. They have built-in handles for easy lifting. Plus, the transparent color allows you to see what’s inside easily. We store extra linens we want to have on hand for summer house guests. The convenient easy-close zipper makes it easy to access things quickly. They’re flexible too for squeezing under beds or on shelves. 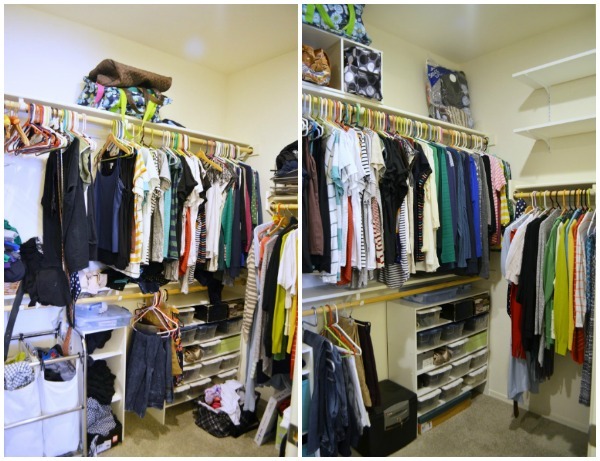 DECLUTTER | Step 1 to an organized closet is clearing out the clutter. Clear the shelves and take inventory of what you have on hand. Bag up anything that is being donated, then trash anything that’s broken, stained, or has no use. Take this time to measure your area to see what space you have available and decide what to purchase. SHELVING| Most builder grade homes only come with a single shelf above the clothes rod. Utilize the space above to add additional shelving. You could build out shelves to match the existing ones, but I love the ease of these track shelves that make it easy to move and readjust as our needs change. They only required 3 screws anchored to the wall and took minutes to install. 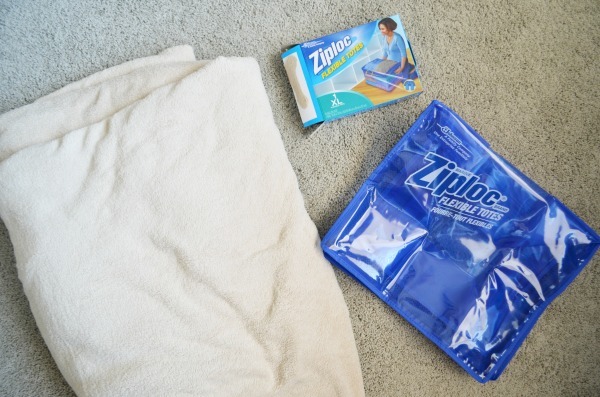 On top, I placed two Ziploc® Flexible Totes with all our summer guest essentials. You can see what the “before” looks like below: so much wasted space and cluttered to the max. We had to push things out of the way to get the door to close. Since we moved, it became a dumping ground for everything that didn’t have a home yet. The opposite side of the closet received the same shelving treatment. After organizing and decluttering, we had room to grow and readjust our storage solutions. REIMAGINE | Rethink the way you use storage. A couple small modular shelves turned on their side become a shelf with dividers on top of a very long shelf. 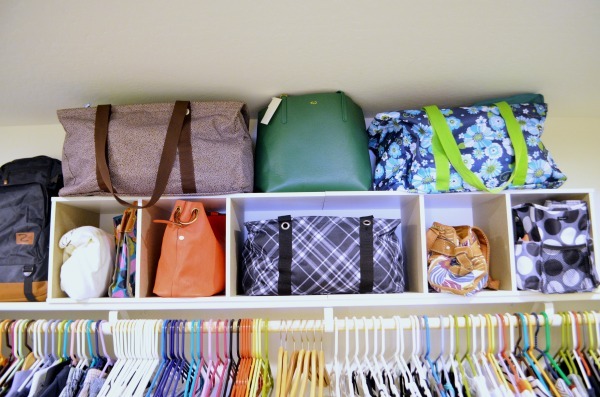 This is the perfect place to keep all your purses and bags organized. STORAGE CUBES | Utilize current storage pieces in new ways to maximize your space. Storage cubes work great with a few fabric bins to hold and hide the essentials. Before, my husband’s shirts and my yoga pants were stuffed inside an open cube or on the shelves under our shirts. The fabric cubes keep everything organized and easy to find for day-to-day use. 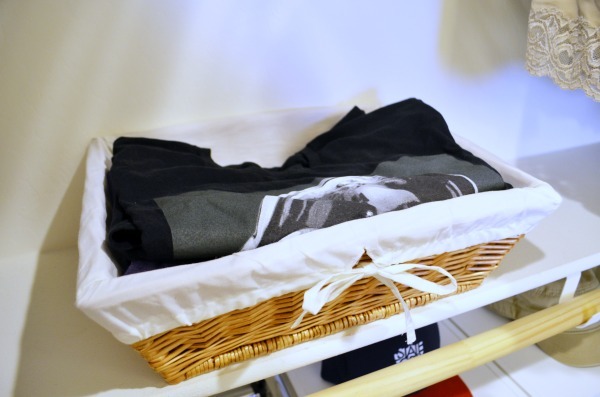 BASKETS| Shallow baskets are another great way to keep the clutter off the shelves and contained: a perfect spot for delicates and socks or your favorite t-shirts. CATEGORIZE | It might sound time-consuming, but organizing your clothing into categories and by rainbow color keeps things organized. 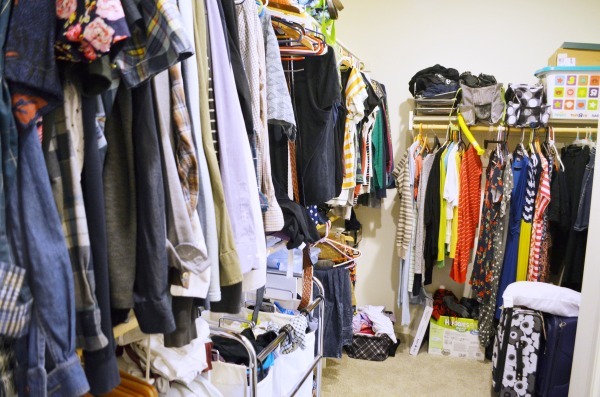 This way of organizing your wardrobe makes it quick to take inventory of what you have. 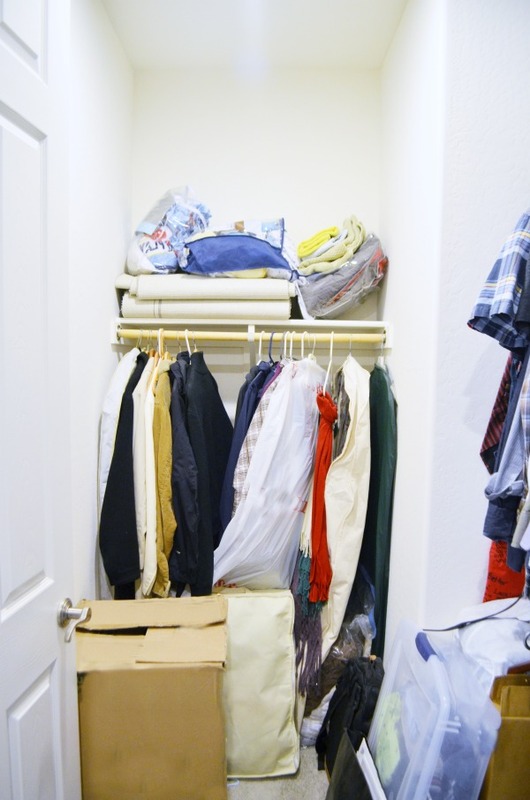 Save valuable time as you get ready, and make putting away clothing simple too. Provide hangers a special spot. 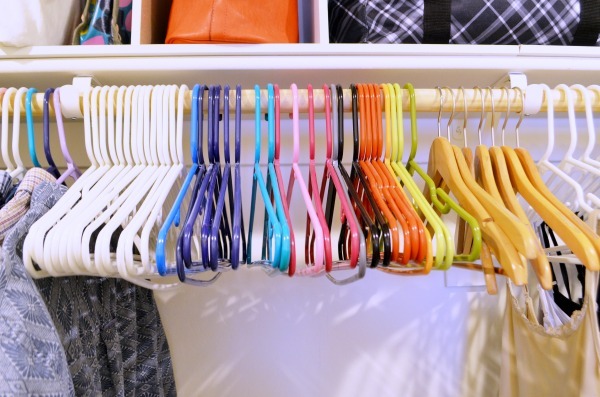 Every time you take an article of clothing out, place the hanger in this special spot. 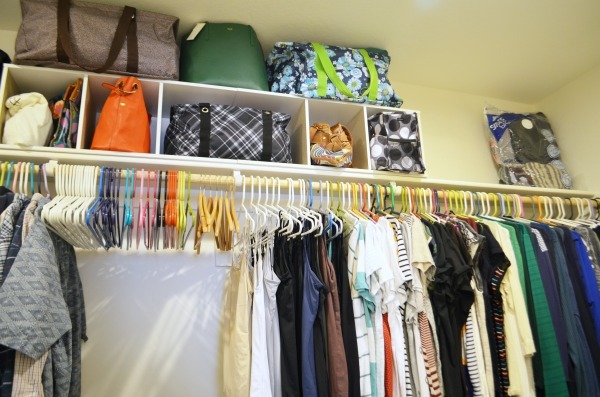 This will keep the hanging space uncluttered, as well as make putting away clothes an easy chore. I even sort by type of hanger so I can locate one for my tank tops or dress shirts easily. 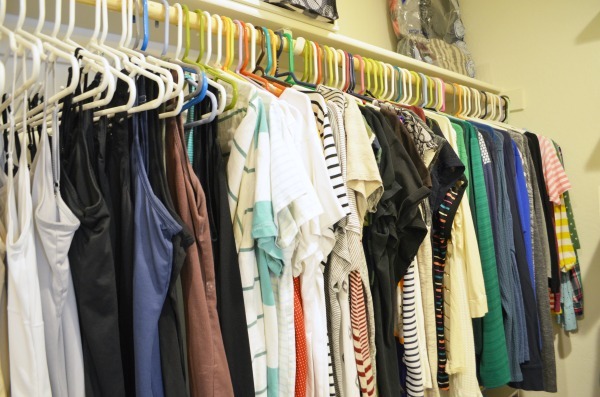 Organizing your closet doesn’t have to be a big chore. We accomplished this makeover in a few hours from purchase to completion. 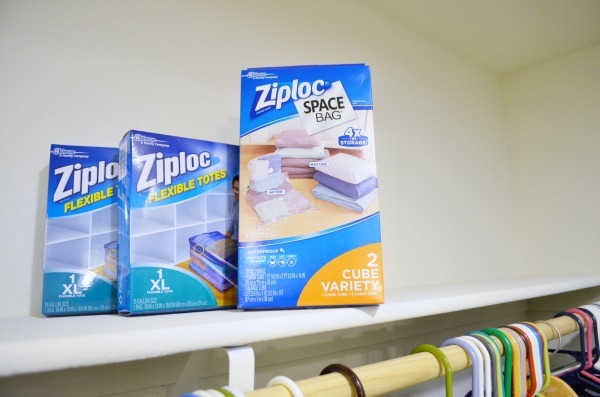 Reimagine new ways to use current storage, declutter and save space with Ziploc® Space Bags®, add more shelving, and categorize your clothes for easy access. 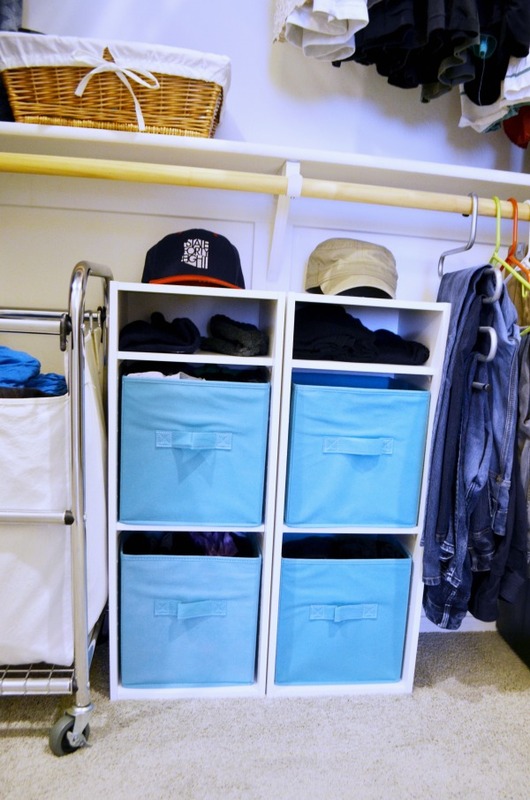 Grab everything you need for an organized closet at Lowes. You’ll find a great selection of Ziploc® storage solutions like Ziploc® Space Bags® and Ziploc® Flexible Totes with the specialty storage. Our store had them on a special display on an end cap near the closet organizers.